Back to the crafts. They always make such great crafts and he has a good time. The tricky part is finding a place for it in the cabin with out it getting lost or squished, and then wondering how we are possibly going to get it home intact. 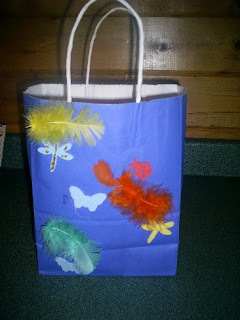 I was so happy this year that the first craft was a gift bag that they got to decorate and personalize. Then as each craft came back to the cabin we would gently add it to the bag. Caleb always knew where is crafts were and we made sure the bag was packed carefully in the van when we came home. 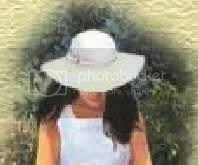 Posted by Lisa at 1:07 p.m.
Thats a great idea....I wish I had thought of it VBS week! August 23, 2007 at 1:13 p.m.